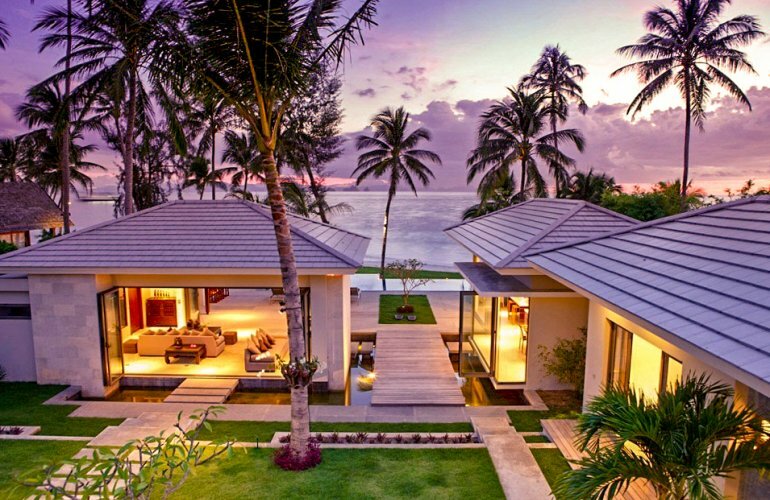 On the beautiful west coast of Koh Samui this splendid beachfront property incorporates two separate villas, each oozing style, space and luxury beyond anyone's dreams. There are a total of eight luxurious en suite bedrooms, two infinity pools, two kitchens, a Zen garden, a beach sala, various dining areas - all making this a stunning vacation venue for families or friends. A superb contemporary Thai-style property right on the beautiful white sand beach of Lipa Noi, and with outstanding sunset and Five Island views, this villa has been built to the highest of standards. It has two independent adjacent villas in their own green and pleasant grounds, one directly on the beach front and the other, with great ocean views, just behind. Both offer Italian designer furniture, Thai nouvelle vogue artistic works, and Thai antique artefacts. The bedrooms and the beachfront living room have air conditioners and ceiling fans, and all the bedrooms have personal safes. Complimentary satellite Wi-Fi Internet access is available throughout the villa for guests's use. The décor is cool and minimal, with a strong use of natural materials and colours, and contrasting yet unifying accessories. The mood is one of spaciousness and light, and over it all flows not only the soft sea breezes, but a harmonious and peaceful aura. Lipa Noi beach is considered to be one of the finest on Koh Samui: it has beautiful soft white sand, and offers great swimming and snorkelling throughout the year. Even when it is low tide, there are still channels which allow swimming and kayaking, and children can take advantage of the exposed rock pools, while older children play ball games on the wide expanse of sand. Difficult as it is to be lured away from this haven of beachside luxury, it is good to know that the villa is only a 40 minute drive to the tourist centre at Chaweng, and just 20 minutes to Lamai, where there are plenty of shopping and eating options. There are several dining choices closer to home, including the famous Nikki Beach. The International airport on Koh Samui is a 45-minute car drive. The approach to the villa is through a quiet residential area of luxury villas, all leading down to the west-facing white sands of Lipa Noi, from where, in the distance, can be seen the imposing Five Islands of the Ang Thong Marine National Park reaching up to the sky. Built around the infinity-edge swimming pool, the beachfront part of this unique villa contains five pavilions and has a central and open living area. Three of the pavilions house two master bedroom suites, plus two guest suites. One master king-size suite has views of the garden and ocean, and its en suite is to the back, with a shower and a bathtub. This leads immediately to a private zen garden, where a relaxing massage can be enjoyed. The second master suite is on two levels: the lower one being an entertainment room, while above is a king size four-poster bed and the en suite bathroom, which also has a shower and a bath tub. The two guest suites have garden views and one has a king size four-poster bed, and the other two twin beds, and both have en suite shower bathrooms. A large Buddha statue calmly watches over the spacious and comfortable living room which makes up the fourth pavilion. Here one can watch TV or read, and with the folding glass doors on two sides thrown back, the sea breezes are enticed in and the Thai concept of no barriers between indoor and outdoor living can be thoroughly enjoyed. There are also ceiling fans and air conditioning in the living area. A powder room is adjacent to the living room. The last pavilion houses the western-style fully equipped kitchen and the dining area, where guests can choose whether to eat indoors, or al fresco overlooking the beach and pool. There is another powder room off the main dining hall. Just like the main living room, the dining room overlooks the pool and the beach, with views to the Five Islands beyond. The beachfront pool has a shallow area for younger children to play in safety, or for adults to lie in, lapping up both water and sun. Around the pool there is a sandwash deck with sun loungers, a sunken sala with sofa benches, a bar and a BBQ area. A grassed area, dotted with palm trees, leads down from the pool to the white sandy beach. The three-storey ocean-view villa of this desirable property is reached through double doors at the back of the beachfront pavilions. This little gem nestles in its own walled garden, with gates to the front and back. There are two double en suite bedrooms on the ground floor with views onto the tropical garden, and the living area and pool are on the first floor. Here, the large infinity-edge pool offers splendid ocean views above the roofs of the beachfront villa. There is a deck area around the pool, and a comfortably furnished sala. At the back of the deck glass doors open wide to the open plan living room where there is a sitting area for TV viewing or reading, a fully equipped kitchen and a dining table. The master bedroom is on the top floor. This has a king size four-poster bed, stunning panoramic sea views, its own private balcony and the en suite has a walk-in rain shower and a bath tub. The size of the property makes it entirely suitable for families or groups of friends to share for either a private holiday together, or another happy but more formal celebration, such as a wedding. Lounging and dining sala by the beach.